The Marriott Executive Apartments Brussels is situated in a spectacular, cosmopolitan city of Brussels, home to famed institutions, cultural diversions, fine dining and beautifully intertwining French and Dutch influences. Splendid area attractions include, the Antwerp, Atomium and many more. Designed for your comfort and convenience, all the 57 spacious and luminous apartments have been beautifully premeditated with separate living and sleeping areas, a fully equipped kitchen and a high-speed internet. 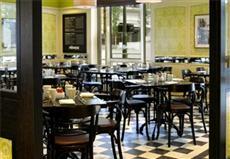 The best way to start a perfect day is to visit the Cafe Parnasse for an energetic full buffet breakfast. The on-site restaurant is a trendy brasserie in the European Quarter serving genuine French food and wine in an authentic French setting. Enjoy the coffee specialties during the day and warp into a trendy, busy bar in the evening.